The dorsum of the hand is exposed to the effects of mother nature (ultraviolet light) which begins to show as crepey, pigmented skin. 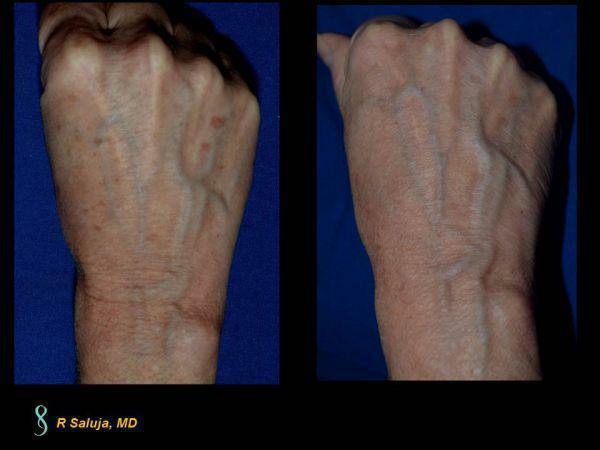 While we can rejuvenate the hand with filler (juvederm), the texture and tone of the skin should also be improved. At Saluja Cosmetic and Laser Center, one of the treatmen modalities that we use to stimulate collagen and elastin, while also targeting the pigmentation is the Picosure Focus Lens. We typically recommend 3-5 treatments for the hands. Melasma is one of the hardest skin issues to treat. The reason is that there is a multifactoral cause for melasma ranging from estrogen, environmental pollutants, UV exposure and even visible light exposure. Sunscreen is imperative to wear. The most important aspect of melasma when trying to treat with lasers is to not induce post inflammatory hyperpigmentation. Probably the best treatment to date is Picosure Focus lens and it typically takes around 5 treatments. Pigmenation of the face can be a cosmetic irritation, especially when extra time is needed to cover the pigment over with make-up. 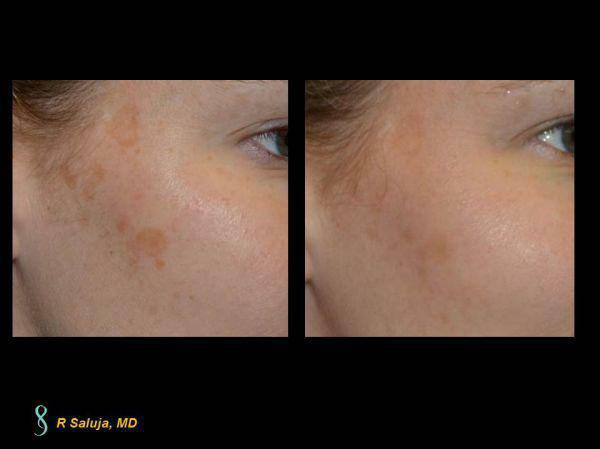 While we treat a lot of pigment with Intense Pulsed Light (IPL), sometimes deeper dermal pigmentation is still left behind. 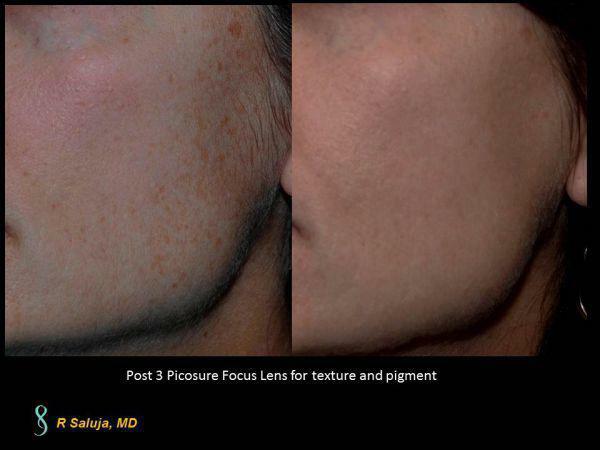 These lower contrast colored areas are best suited for a laser and the laser that Dr. Saluja at Saluja Cosmetic and Laser Center uses is the Picosure Focus Lens to target the deeper dermal pigmentation that IPL alone cannot get. Our hands are constantly washed and any sunscreen placed on the hands unfortunately gets washed off. The UV rays come through our car window and beat down on our hands on the steering wheel and continue to exert its environmental aging. While we can address several issues of the aging hand by revolumizing the hand, one of the most profound improvements can be in clearing the pigmentation and improving the collagen. 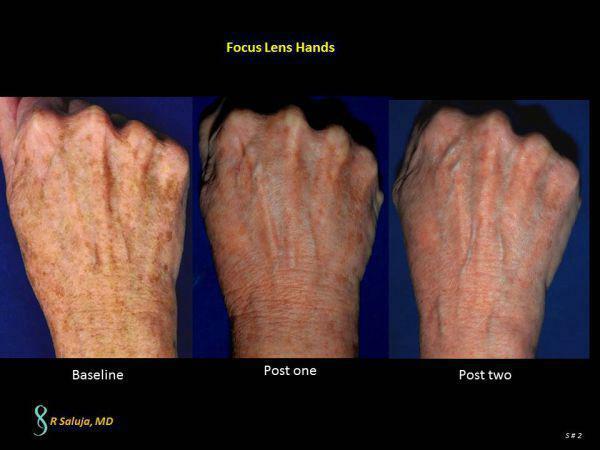 This Charlotte, North Carolina patient did just that with a Picosure Focus Lens treatment to her hands. Melasma is one of the toughest skin ailments to treat. We either recommend no treatment or a trial of the Picosure Focus Lens. This Charoltte, North Carolina female enrolled in a study for Picosure focus lens for melasma. This is status post 5 treatments with the Focus Lens. Pigmentation on the face can either be superficial, located more on the epithelial layer or at times, can be located deeper in the dermis. The superficial pigment can be addressed with an IPL, but the deeper dermal pigmentation can often be hard to clear with IPL only. Picosure Focus Lens is a good choice when trying to target this deeper pigmentation. 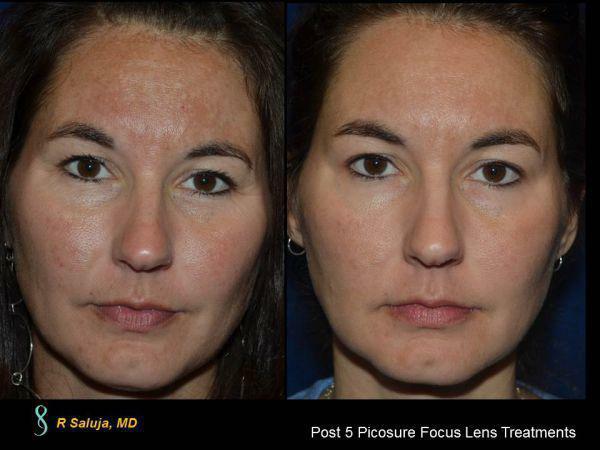 Here is a patient who is status post one laser treatment with the Picosure Focus Lens. 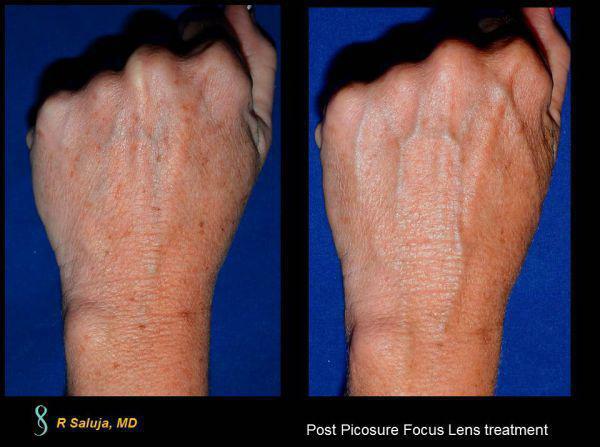 Picosure Focus Lens for Hand Rejuvenation helps to diminish the pigmented sun spots in Charlotte, North Carolina patients that want a more rejuvenated hand. This is a patient who is status post 4 treatments 4 weeks apart. 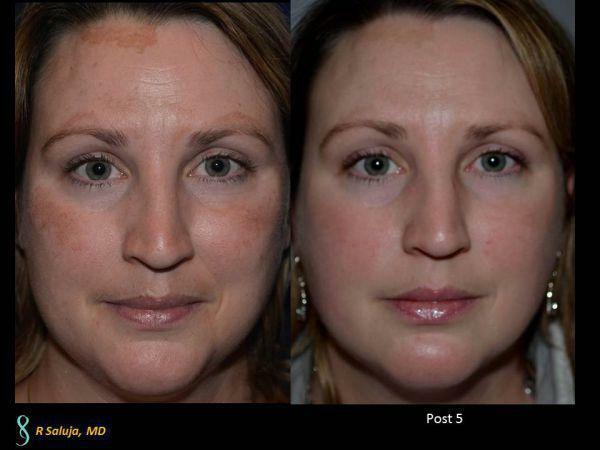 Not only did the pigmentation or brown spots diminish, but the quality of skin improved as the laser is known to stimulate elastin and collagen.